There was some relief and no argument with principal race officer Peter Craig’s decision to cancel racing on day two of the Loro Piana Superyacht Regatta 2011 in Porto Cervo. The forecast for strong winds proved correct, and many sailors shared the race committee’s view that it would have been dangerous to send out these 27, predominantly cruising-oriented, large yachts into breeze gusting in excess of 30 knots. 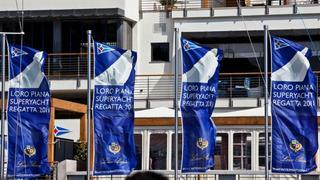 Video highlights and photos from today are available to view on the Loro Piana Superyacht Regatta website. This morning a number of protests were heard from race one the previous day. Magic Carpet 2 was disqualified following a complicated port/starboard incident at mark one of the Performance Division’s first race. Ganesha, which had won the Cruising Division’s first race on corrected time yesterday, was given a 10% time penalty after sail problems had forced the crew to resort to using the engine during racing. Harry Macklowe’s Unfurled now moves from 2nd into pole position in this 19-boat fleet. Ganesha’s owner Dr. Peter Wacker commented: ‘We had a series of problems that resulted in two men up the rig, and to keep them safe we felt justified under sailing instruction 5.1 to use the engine, although the jury disagreed. Race officer Peter Craig hoped that good lessons would be learned from the incident. ‘What Ganesha did, they believed was entirely within the new rules for superyachts, which have a large emphasis on safety and collision avoidance. There was debate as to whether they interpreted that rule correctly or not, and nothing is black and white in these cases. With the lack of racing today, some Italian sailors went for a game of football, some British, Kiwi and South African sailors went for some touch rugby. Others preferred to attend a pasta masterclass with a 3-Michelin-starred chef from Restaurant Da Vittorio, hosted and organised by Loro Piana. This afternoon, crew gathered for refreshments in Piazza Azzurra courtesy of Pantaenius Yacht Insurance and later this evening, Bob Oately hosts a cocktail at the YCCS to celebrate the formation of the new superyacht division at Audi Hamilton Island Race Week - Australia's premier sailing regatta. Racing is scheduled to continue tomorrow at 12:00 and the forecast is for approximately 20 knots of westerly wind.